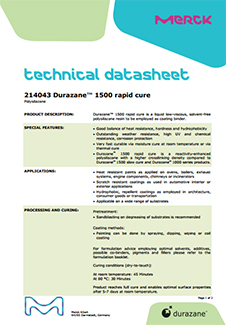 Durazane® 1500 rapid cure by Merck KGaA, Darmstadt Germany is a low viscosity, solvent-free polysilazane resin to be employed as coating binder. It possesses good balance of heat resistance, hardness and hydrophobicity. It shows excellent corrosion protection, and excellent weather-, UV- and chemical resistance. It exhibits fast curing by moisture curing at room temperature or thermal curing. It can be diluted with organic solvents such as esters, ethers, aromates or ketones. Resin reacts in the presence of water, water vapor or alcohols. 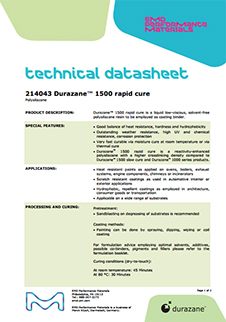 Durazane® 1500 rapid cure has high crosslinking density. It is suitable for heat resistance paints as applied on ovens, boilers, exhaust systems, engine components, chimneys or incinerators. It is also used for scratch resistance coating as used in automotive interior or exterior applications as well as hydrophobic and repellent coatings such as architecture, consumer goods or transportation. The shelf life is 18 months at 5-25°C. In the United States, Canada and Puerto Rico the performance materials business of Merck KGaA, Darmstadt, Germany operates as EMD Performance Materials.